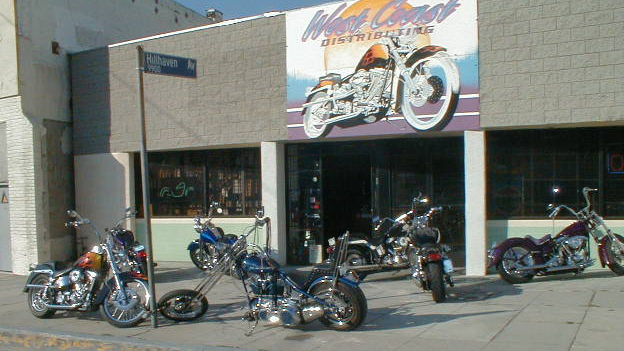 West Coast Distributing has been around for 15 years and what started out as a local part of the neighborhood has now become a well known part of the motorcycle world. It's an "Old School" type of bike shop. A supporter of the SFV Hells Angeles to the grandfather on his Road King, Barry serves anyone's needs. Whether with top notch shop work or the huge supply of parts, ranging from "the ground to the pound" and any nut or bolt between. Now a part of the business community, local born and raised owner Barry has kept West Coast Distributing a place where you can go to just ask a question, or build that bike you have always dreamed of. And be sure West Coast Distributing will give you the best service and price to be found.